Today we returned to the Jordan Valley (Roman Perea) to a site designated Bethany Beyond the Jordan in the country of Jordan. Enough evidence was presented to easily convince various religious orders to build new churches in the area. The site on the west bank of the Jordan that I visited in 1967 has been closed to the general public since June of 1967 I think. You will see by the photo that I made this morning that the river is extremely low. 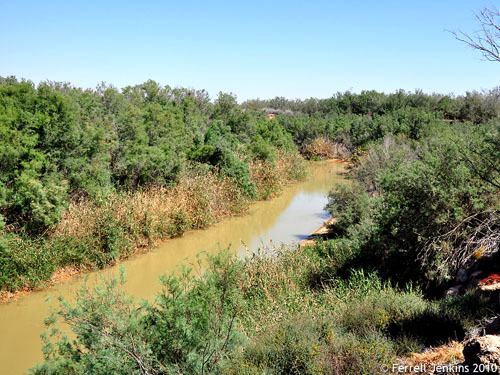 Just last evening I read the article from The Jerusalem Post by way of the Bible Places Blog about the study that says the river will be dry by next year. Jordan River at Bethany Beyond the Jordan. Photo by Ferrell Jenkins. Now that Jordan is seeing many tourists come to the eastern side of the river, Israel is preparing to open the site on the western side of the river. There were several people on the Israel side today where construction continues. 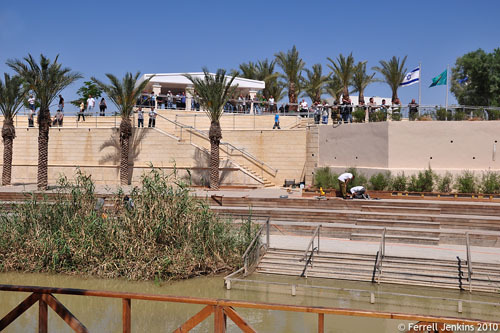 Jordan River Baptism Site in Israel and Jordan. Photo by Ferrell Jenkins. In spite of the fact that the river water is reported to be mostly sewage, several were being baptized, or dipping themselves, in the water when we were there. We also visited Mount Nebo and Madaba before traveling south about 4 hours to Petra for the night. This entry was posted in Bible Places, Bible Study, Culture, Israel, Jordan, New Testament, Travel and tagged Ministry of Jesus. Bookmark the permalink. Was the Jordan River in Bethany really dirty and mostly sewage since the time of John the Baptist or it was clean and nice before and then become dirty and mostly sewage just today?